Posted on Wednesday, March 21st, 2018 at 10:54 pm. Semographics III Monoprinting Collaboration, is an exhibition that presents the work of 12 printmakers who joined in a weeklong experiment to print together as a team, using silkscreen (the fine art terminology is “serigraphy”, hence Semographics)) and relief printmaking. 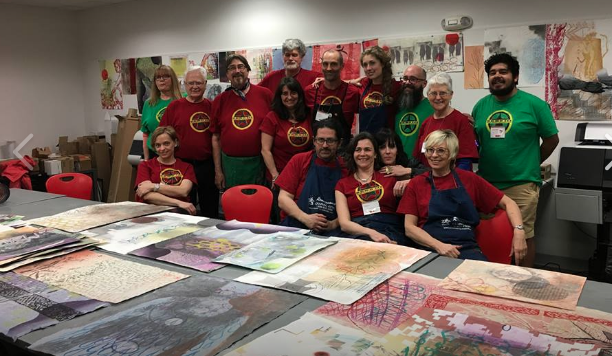 The collaboration event took place in March 2017 onsite at the Atlanta Printmakers Studio and the Savannah College of Art & Design – Atlanta, and was a featured event at the annual Southern Graphics Council International Conference. 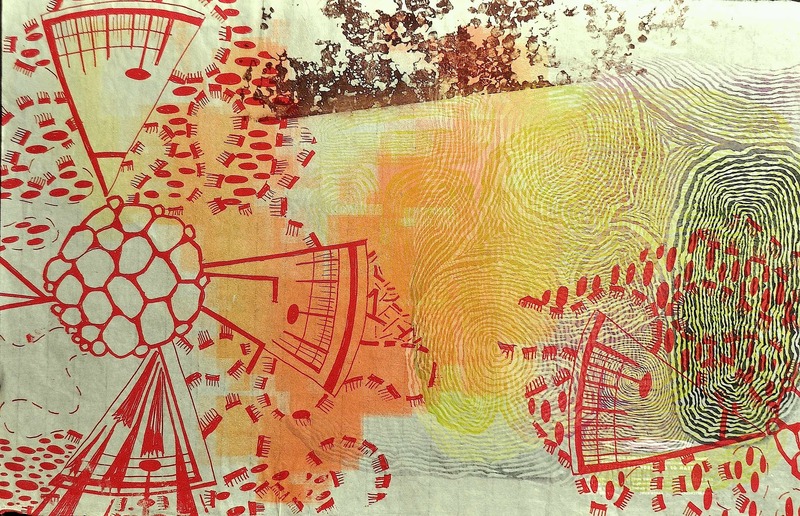 The resulting prints are a cross-disciplinary challenge – even a stylistic and technical mixed media “mash up” – with each unique print showing iterations, beautiful moments and graphic themes. The group conducted a collaborative protocol involving a ‘Neutral Zone’, where all of the ‘in progress’ impressions were ‘up for grabs’ for anyone to embellish; and the ‘Safe Zone’, where any impressions deemed as ‘finished’ or aesthetically resolved were kept. Allowing the process to develop, over 150 prints were made with layers from different artists, hand applications of color and drawing, and aesthetic touches and special printing effects. Each work represents collective solutions to enhance and “solve” imagery from what other artists had done. Ultimately, the print series is a critical examination of choices, each artist’s practice, of technical demands, and stamina. This Semographics III portfolio of 50 selected works is traveling for exhibitions nationally, including the presentation at Constellation Studios. The project was organized by Professor Timothy High, University of Texas Austin, with co-chair Stephanie Hunder, Concordia University, St. Paul, MN. The other participants are: Kathryn Maxwell, Arizona State University, Tempe; Sandra Fernandez, New Jersey; Brian Johnson, Texas State University, San Marco; David Newman, Brookhaven College, Dallas, ; Karen Kunc, University of Nebraska-Lincoln; Lenore Thomas, University of Pittsburg PA; Amanda Knowles, North Seattle College, WA; Eric Avery, Pennsylvania; John Hitchcock, University of Wisconsin-Madison; Sofia Maria Paz, University of Texas Austin.